Corning Glass Technologies has launched a second video in what appears to becoming a series, “A Day Made of Glass”. 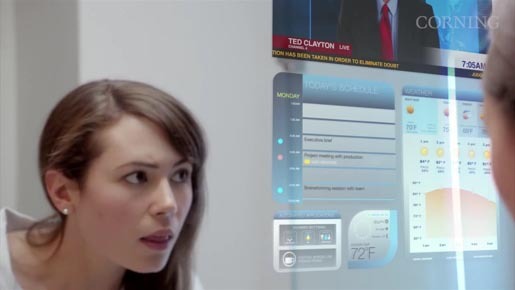 The first video, released in February 2011, follows the waking hours of a family with access to futuristic technology-enhanced glass, including organizing a daily schedule with a few touches on the bathroom mirror, chatting with far-away relatives through an interactive video on the kitchen counter, and reading a classic novel on a whisper-thin piece of flexible glass. The second video, released in February 2012, brings the same family back for a new exhibition of the powers of engineered glass. The Day Made of Glass campaign was developed at Doremus, San Francisco, by interactive media creative director Michael Litchfield, and agency producer Catherine Hunter. Filming was shot by director Dave Mackie via Rough House, San Francisco, with executive producer Todd Lindo, producer Lisa Tesone, director of photography Norman Bonney, production designer Sterling Storm, editor Marc Cebrian . Visual effects were produced at Westernized Productions, led by VFX supervisor Marcello Grande.